Operators of the bigger Kuala Lumpur eateries might as well surrender to the authorities once Section 114(a) of the Evidence Act takes effect. It would be too risky for them to offer WiFi services to patrons, said BFM radio producer Jeff Sandhu (left) . This is especially in view of KL City Hall’s announcement in January that food operators occupying premises bigger than 120 sq m must offer WiFi services as a prerequisite for licence application and renewal. “If you are running a restaurant in Kuala Lumpur and, by law, you are required to have public WiFi, you might as well walk to jail or walk to the cops and say ‘Arrest me!’” said Sandhu. Sandhu, who produces BFM’s ‘Tech Talk’ segment, was a panelist at a forum last night to discuss the impact of Section 114(a) of the Act. The amendment would presume that the owner, editor or administrator of a website on which any posting appears – or the owner of the Internet connection or equipment with which the posting was made – is also the person who made the posting, unless it is proven otherwise. Another panelist, Digital News Asia co-founder A Asohan (right) , said Malaysia has a thriving Internet business scene. Investors believe this could outpace that of Singapore, but the amendments would put a damper on it, he said. “You can’t have an Internet economy when people fear for the Internet. You can’t have a high-income nation when people fear to express themselves,” he said. He also quoted management consultancy firm McKinsey & Company as saying that Internet businesses contribute 4.1 percent to Malaysia’s GDP. “You want to create a high-income nation. How do you do that? You need have people who are intelligent, educated in the right way – not merely drilled in the basics of science, maths and (who) just answer the questions,” Asohan said. Responding to moderator and The Nut Graph editor Jacqueline Ann Surin, he said online media platforms would be the first victims of this law. Sandhu pointed out it is very easy to forge identities online, and that there is even a 10-step guide available online on how to impersonate another person’s email address. “It puts the average Internet user at the mercy of the unscrupulous tech-savvy user. It is shielding identity thieves and hackers,” Asohan said. KL Bar IT committee co-chairperson Foong Cheng Leong said it would be difficult to handle even the “rebuttable presumptions” once a person is charged. “You go to court (with a civil suit). The fees are at least RM50,000-100,000 and you are there to defend against a High Court case as a normal, middle class, working citizen,” he said. Foong said this would not even be possible if it were a criminal proceeding because the modus operandi of the police would be to confiscate the equipment. “Once they take it from you, how are you access your own PC and show that ‘at this time I did not access anything’? The thing is lying somewhere in a exhibit room,” he said. Foong said there is a need to deal with Internet trolls (people engaging in anti-social behaviour online), but the new law is not up to the task. “We need something more technical. We need expertise to trace people online. The law is not the way to solve this. It is simply putting the blame on someone. In Chinese, we call this ‘eat the dead cat (being a scapegoat)’,” he said. Centre for Independent Journalism director Jac SM Kee said the new law restricts freedom of expression and promotes a culture of surveillance. The media watchdog has started an online petition against the amendments. 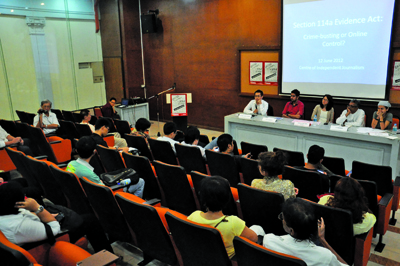 Public Forum – Section 114A Evidence Act: Crime-busting or Online Control? I will be speaking at the above event today. The Centre for Independent Journalism (CIJ) is organising a public forum on the newly introduced Section 114(a) of the Evidence Act 1950 which has a huge impact on the average Internet user. Our panel of experts will discuss the amendment and its implication on online expression and Internet rights, looking at it from the point of view of not just the average user but also the IT industry, especially upcoming technopreneurs. Section 114A Evidence Act: Crime-busting or Online Control? The forum will look at the newly introduced amendment and its repercussions on Internet users, especially on the people’s rights to freedom of expression online. Foong Cheng Leong is the KL Bar IT committee co-chairman and member of the Bar Council Intellectual Property Committee. He regularly comments and writes on issues pertaining to social media and internet laws and the latest being “Grave Repercussions for Internet Users” published on LoyarBurok.com. Jac sm Kee is a feminist activist working on the area of internet rights, feminism and sexuality. She’s the women’s rights policy coordinator for the Association for Progressive Communications, and one of the directors of CIJ. Jeff Sandhu is producer for Tech Talk on BFM radio. Tech Talk is a technology segment dedicated to business owners, IT managers and the average user. This 30-minute segment from Mondays to Fridays has been on Malaysian airwaves for 3 years. Jeff comes from a multimedia design background, majoring in video and animation, and has worked in advertising and post-production. A. Asohan spent 20-plus years with The Star, Malaysia’s No 1 English daily, mainly with the paper’s technology pullout In.Tech and with its digital or online media operations. In 2010, he left to take over as the Senior Public Relations Manager at Microsoft Malaysia, but returned to journalism recently to formDigital News Asia, a technology news portal, with two others.